Vancouver, British Columbia--(Newsfile Corp. - April 2, 2019) - Thunderstruck Resources Ltd. (TSXV: AWE) (OTCQB: THURF) (The "Company") is pleased to announce that the first focused geophysical surveys ever conducted on its exploration projects in Fiji have confirmed high-priority drill targets beneath extensive surface geochemical anomalies. The coincident chargeability high and resistivity anomalies, together with the widespread surface mineralization, in this geological setting and with extensive hydrothermal alteration, are characteristic of large gold-copper mineralizing systems and related epithermal veins. "These results show that our Rama copper-gold porphyry target geophysical anomaly extends to a depth of at least 500 meters, far deeper than Anglo's discovery hole in 1975, which ended in mineralization at 244 meters," stated Bryce Bradley, Thunderstruck President and CEO. "A drilling program will determine the ultimate size of this exciting target." 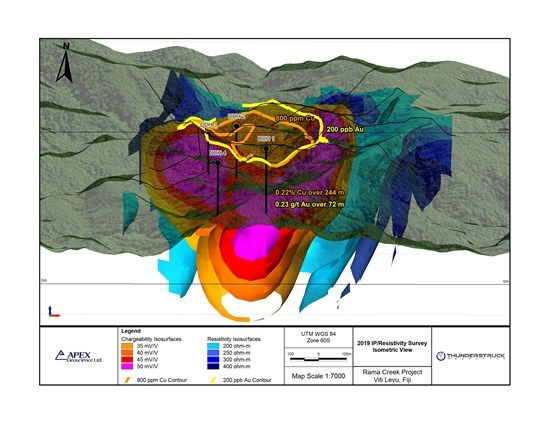 "The results from our Liwa gold prospect also indicate that geophysical anomalies associated with wide-spread surface mineralization extend to a depth of at least 300 meters below each of our four gold targets, where prior sampling and trenching showed locally high grade gold mineralization at surface," she noted. "With this confirmation of depth potential, we are now ready to determine specific drill targets for each of our identified gold prospects. It's important to note that, in all cases, the anomalies are open to depth beyond the limits of the geophysical surveys." JOGMEC (Japan Oil, Gas and Metals National Corporation) has notified the Company that it has satisfactorily completed due diligence on the Korokayiu Zinc-Copper Project (previously Wainaleka) (See the Company's news release dated February 28, 2019). The team has commenced re-opening of access roads and camp building in preparation for the 2019 CAD$900,000 Korokayiu Joint Venture work program comprising property-wide ground gravity geophysical surveys, detailed geologic mapping, and surface rock geochemical sampling, followed by a 1,600 m diamond drill program. The chargeability and resistivity low anomalies are coincident at surface with semi-circular, greater-than-800 parts-per-million copper and greater-than-200 parts-per-billion gold ridge-and-spur soil geochemical anomalies (see the Company's news release dated October 22, 2018). In addition, an historic Australian Anglo American Ltd (Anglo) diamond drill hole "DDH1" within the surface anomaly returned a 244-metre interval, between depths of 6 m and 250 m, averaging 0.22% Cu and ending in mineralization (including a 72 m interval between 6 m and 78 m averaging 0.23 g/t gold). 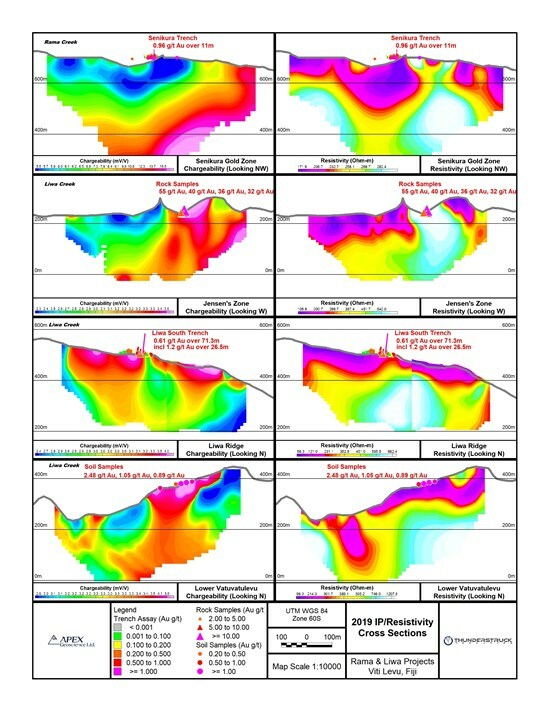 The results of the Rama Creek Porphyry IP/Resistivity survey are significant in that inversion results demonstrate the chargeability and resistivity anomalies extend to a depth of a least 500 m. This represents at least 150 m below the limit of historic drilling by Anglo Pacific, which ended in mineralization and is coincident with Thunderstruck's recent soil geochemical surveys. A single 1 km survey line transecting the Senikura Gold Zone defined a 60-meter-wide, less-than-200-Ωm, resistivity low (conductive) anomaly extending to a vertical depth of 150 m coincident with the 2018 surface trenched zone that returned assays of 0.96 grams-per-tonne gold (g/t Au) over 11.1 m, within a broader anomalous gold zone averaging 0.55 g/t Au over 37.6 m (see the Company's news release dated March 1, 2018) (Figure 2). High grade gold bearing plus base metal quartz veins at Jensen's are coincident with an approximately 100 m wide greater than 600 Ωm steeply north dipping resistive, and narrower 60 m wide weak sub-vertical chargeability anomaly extending to a depth a 250 m; the limit of the geophysical inversion (Figure 2). Thunderstruck Resources is a Canadian mineral exploration company that has assembled extensive and highly prospective properties in Fiji on which recent and previous exploration has confirmed zinc, copper and precious metals mineralization. The Liwa Creek gold prospect and Rama Creek copper/gold porphyry are two of the Company's four distinct projects. The Company provides investors with exposure to a diverse portfolio of exploration stage projects with potential for zinc, copper, gold and silver in a politically safe and stable jurisdiction. Thunderstruck trades on the Toronto Venture Exchange (TSX-V) under the symbol "AWE" and United States OTCQB under the symbol "THURF." The 2018/2019 IP/Resistivity ground geophysical surveys utilized a pole-dipole array with a 100 m (Rama) and 50 m (Liwa) "a" spacing at "n" separation of 1 to 12. Readings were taken in the time domain using a 2 second on /2 second off alternating square wave. Chargeability values are for the 690-1050 msec interval after shutoff.